Lithuania midfielder Darvydas Sernas has become Ross County's fourth signing of the January transfer window. The 30-year-old was previously with Wigry Suwalki, who are 14th in Poland's second tier. County manager Jim McIntyre said: "He has 35 international caps for Lithuania under his belt, bringing a wealth of experience to the squad." Sernas started his career with Dainava Alytus in his homeland and has also played in Russia, Turkey and Australia. 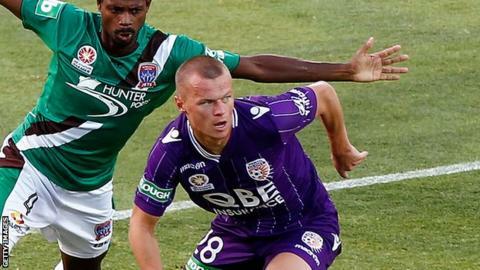 After leaving Dainava, he had spells with Vttra, Spartak Nalchik, Widzew Lodz, Zaglebie Lubin and Gaziantepspor, who sent him on loan to A-League outfit Perth Glory last year. County have already signed former Celtic defender Marcus Fraser,striker Craig Curran, previously of Nuneaton Town, and defender Cameron Burgess on loan from Fulham during January. The Dingwall side are bottom of the Scottish Premiership, four points behind 11th-placed St Mirren but with two games in hand.